I have spent the past two weeks in New York. I’ve written before about cycling in Jamaica, Queens, NY, so won’t repeat it all. But it’s a tough place to cycle; even supposedly quiet residential roads can have cars (nearly always SUVs) accelerating at top speed. It’s a little scary place to cycle, which is probably why it’s so rare to see a cyclist in Queens. 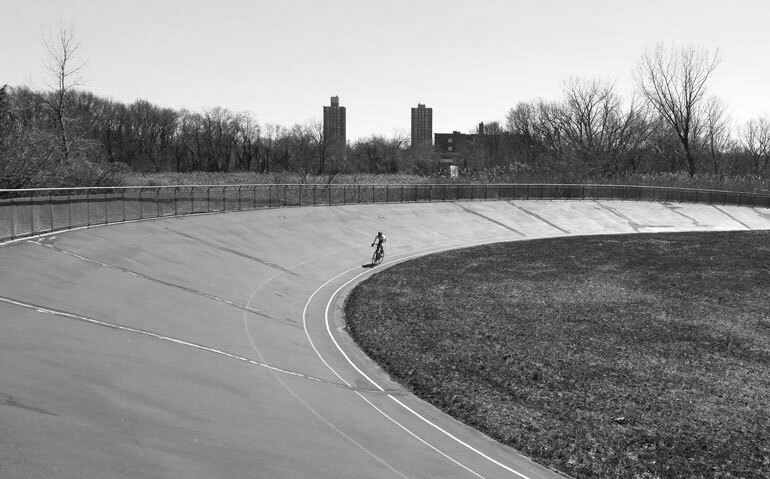 But, the one great piece of good fortune is the outdoor velodrome of Kissena Boulevard. It is bumpy concrete, but it is traffic free and a safe place to cycle. It seems always open, and perhaps just one or two other cyclists going around during the week day. The only training during the two weeks was to cycle two miles to the velodrome then ride for an hour at varying degrees of intensity. It’s no joke cycling around a velodrome for an hour. Not as boring as being on a turbo, but it gave a new respect for track cyclists. 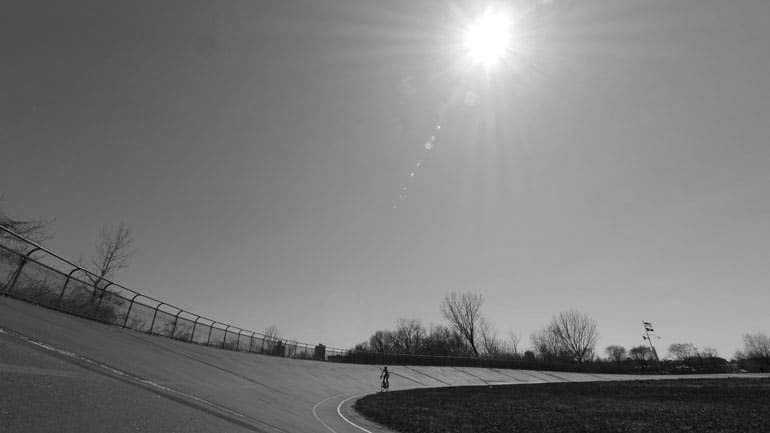 I was caught between gratitude for having a velodrome to cycle on and the difficulty in motivating myself to keep riding around in circles. Despite riding as fast as I could for an hour, I can readily admit I didn’t break the world hour record or even get anywhere close. I managed to average 22.7mph for an hour; that was my best effort. The world hour record is closer to 32 mph. Of course, I have plenty of excuses for relatively slow speed – cheap road bike, tyres at low psi, bumpy surface e.t.c. But, I wasn’t paying much attention to records. No power meter, no heart rate monitor, just speed, average speed, and the clock ticking slowly by. Old school and I quite liked it. During the two weeks I took quite a few rest days, and did just about enough to tick over, but it was hardly good training for 100 mile time trials or anything like that. Flying back from JFK was also an experience. 10 hours delay overnight, lying on the floor with irritating lounge music being pumped out all night preventing sleep. I think they play loud music all night to discourage people from sleeping in airports – I can confirm it’s very successful. Another day lost to training, but it could have been worse. I think outdoor velodromes in city centres are an excellent idea, and I felt quite grateful for its existence in New York. They have some races on the weekend, but during the working week it seems pretty clear. During the hour, other people often joined for a few laps of the track. It was interesting how many people came to the track and just did 2-4 laps (0.5 – 1 mile) and that was it. I didn’t do any intervals or sprints, but just maintained a metronomic speed of a time triallist, every time I went. The one disconcerting thing is that people love to fly model aeroplanes and drones over the velodrome. You’re riding around the velodrome and there is this drone (which looks like mini-flying saucer) hovering over your head. But, if anyone was watching a live stream, it was pretty boring stuff. Unlike Paris Roubaix, it’s a shame I missed watching that race. It sounded like the race of the season.